Holograms of human figures are displayed during a 'ghost protest' against South Korea's president in front of the Gyeongbok Palace in Seoul on Wednesday. Amnesty International in Korea said it decided to use the holograms after protesters were denied permission to march. See the video below. On the eve of South Korean President Park Geun-hye&apos;s third anniversary in office, protesters gathered in Seoul on Wednesday to condemn the administration&apos;s increasing crackdown on free speech. These protesters were unlike any others Seoul has seen. They were holograms. 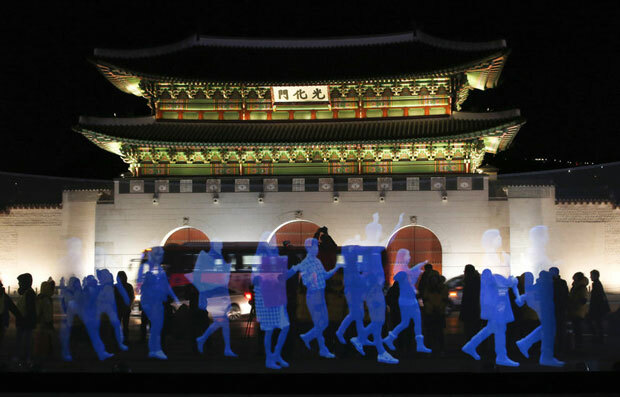 The life-size hologram "ghosts" marched across a transparent screen facing an old palace gate at Gwanghwamun Square, a historic center in Seoul. "Promise us democracy! Promise us freedom of assembly!" the holographic figures chanted for 30 minutes, as a real crowd of more than 100 — mostly journalists and organizers — watched. The "ghost protest," organized by Amnesty International in Korea, followed the world&apos;s first-ever hologram demonstrations in Spain. Last April, thousands of virtual demonstrators marched in Madrid to protest the controversial Citizen Safety Law, which set extreme fines for demonstrators convening outside government buildings. In South Korea, concerns have been raised over the government&apos;s attempts to ban protests and its use of a Cold War-era national security law to make certain kinds of speech illegal. "Freedom of speech and assembly has deteriorated since Park Geun-hye took office," says Ahn Se-young, a campaign manager at Amnesty Korea. "Why can we hold a demonstration here only as ghosts? That&apos;s what we want to ask." Amnesty Korea&apos;s initial request to hold a rally — a live, human one — was rejected by the Seoul Metropolitan Police earlier this month, on the grounds that the rally would disrupt traffic. The refusal prompted Amnesty to organize the virtual gathering, filming 120 volunteers on a blue screen and encouraging citizens to upload their voices to the Amnesty website. The Seoul Metropolitan Police warned organizers that the holographic rally was to be strictly a cultural festival — not a demonstration. "We will restrain anyone who chants along to the hologram or expresses a collective will. That in and of itself is a demonstration," said Chief Lee Sang-won at a news conference. Police suppression of free assembly in South Korea has drawn international concern in the past year. Last April, tens of thousands of police blocked demonstrators criticizing the government&apos;s response after the Sewol ferry disaster, which killed 304 people, mostly high school students from the same school. In November, police suppressed a mass rally opposing the Park administration on various issues and arrested hundreds of demonstrators. According to Amnesty International, the number of water cannons used by the South Korean police multiplied sixfold between 2014 and 2015; chemical irritants used in liquid gas multiplied threefold. "Today&apos;s ghost protest must be the last," Amnesty said in a statement at the hologram rally. "Instead of a ghost protest lacking rights, we demand that real people be able to enjoy freedom of assembly. Assembly is a human right."